The Mermaid's Tale: You're as good as your face makes you be -- phrenology is back! You're as good as your face makes you be -- phrenology is back! Researchers spanning many scientific domains, including primatology, evolutionary biology and psychology, have sought to establish an evolutionary basis for morality. While researchers have identified social and cognitive adaptations that support ethical behaviour, a consensus has emerged that genetically determined physical traits are not reliable signals of unethical intentions or actions. Challenging this view, we show that genetically determined physical traits can serve as reliable predictors of unethical behaviour if they are also associated with positive signals in intersex and intrasex selection. Specifically, we identify a key physical attribute, the facial width-to-height ratio, which predicts unethical behaviour in men. Across two studies, we demonstrate that men with wider faces (relative to facial height) are more likely to explicitly deceive their counterparts in a negotiation, and are more willing to cheat in order to increase their financial gain. Importantly, we provide evidence that the link between facial metrics and unethical behaviour is mediated by a psychological sense of power. Our results demonstrate that static physical attributes can indeed serve as reliable cues of immoral action, and provide additional support for the view that evolutionary forces shape ethical judgement and behaviour. And, "In turn, we expect that the feelings of power held by men with relatively large facial WHRs will affect ethical judgement and behaviour. Individuals who feel powerful are more likely to act in their own self-interest and feel less constrained by social norms or concerns. Additionally, a general sense of power has been linked directly to unethical behaviour, such as cheating." They assessed their subjects' sense of power with a questionnaire, measured their WHRs from photos, and determined whether they were deceptive or had cheated during the study, and analyzed the results. It turned out that men with higher WHRs, but not women, reported higher sums of the dice. That is, men with wider faces were more likely to cheat. And the authors know why. They say that for the first time, they have identified the 'psychological underpinnings' of this relationship; the 'psychological experience of power'. 'Men with greater facial WHRs felt more powerful, and this sense of power directly affected their ethical behaviour.' And of course they have evolutionary explanations that account for their findings being true for men but not women. It's hard to know where to start with this. The conclusions of this study depend so much on the wording of the assumptions and hypotheses that it feels like a house of cards. They claim to have identified "a genetically determined physical predictor of unethical behaviour." Meaning what? That immorality is a genetically determined behaviour? Of course, it's hard not to conclude that this means that Asians, who have rounder faces than Europeans or Africans, cheat like the devil, while the rest of us are as innocent as new fallen snow. And native Americans, and Australian natives, have smaller--or was it narrower?--heads than Europeans. Hmmm, wasn't this kind of crap, the standard justification for racism and European imperialism, disposed of along time ago? Or does this mean that evolution--not short-term cultural conditioning and so on--over thousands of generations and across continents, favored wide faces because this level of 'cheating' got men the girls? If that is the case, then why aren't we all more or less similarly rotund? If you are determined to defend this kind of reasoning, of course you can always back and fill and find rationales and excuses for why counter examples don't count, why very small differences lead you to infer natural selection strong enough and consistent enough to make a difference, and so on. And if you accept this, perhaps you'd want to buy one of our classical eugenics books (we'll tell you the cost, but of course whether they're worth it or not can only be determined by measuring our faces, and we refuse to be so starkly exposed). By the way if men wear beards (an option not open to women, sadly), does this widen their heads and lead them to cheat (because it was their genes that made them decide to wear beards), or something like that? Is someone funding this kind of science? And what could possibly be their motive, unless it is, in fact, to return to the abuses of the eugenics era? Sadly, there's nothing new here. 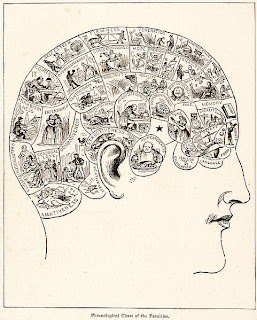 Phrenology, the determination of a man's character by measuring the bumps on his skull, was very popular in the 19th century, and widely accepted, though now considered to be bunkum. Here's more of the same. Once again, posing as science. What is interesting is why, in the first place, is it so common for us to think that we can predict a person's behavior from their anatomy? Each of us, in our own experience, can perhaps make generalizations. But our experiences don't need to be a random sample of anything, and in any open search for pattern in limited samples will be able to find something. Or, at least, that could be a plausible reason for the idea. There's no reason in principle why a gene 'for' body size can't also affect brain activity patterns (i.e., one can imagine it is possible). But the extension of these rudimentary ideas to this kind of research is a stretch, especially given the determination of people that they will find such things and that they'll be both clear (significant as well as important) and that they can safely be extrapolated back over evolutionary time. To me the latter is the most questionable of the aspects of this kind of work, along with the motivation that drives it.